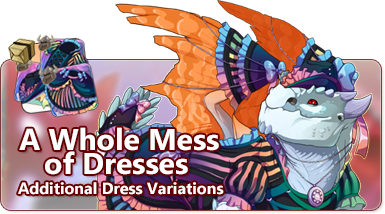 Due to their popularity, a whole new spectrum of dresses is now available for well-to-do dragons. A decorative bustle and skirt, flowing extravagantly from the waist in waves of rippling fabric. This versatile pair of finery can either be worn with or without an accompanying skirt, depending on the kind of statement the wearer wants to make! A lacefront bodice constructed of highly fashionable fabric. The sleeves are real poofy! A simple yet eye-catching wrap of ruffles and ribbons that is worn on the tail. If one is looking to make their wings stand out, this decorative drape is the perfect accessory. A smart pair of soft spats help to pull off the whole look! A smart pair of soft gloves help to pull off the whole look! Contains the Glamorous Scarlet ovalcrown, locket, bustle, knickers, bodice, tailtaille, garniture, spats, and gloves. The whole set! Contains the Kelly Green ovalcrown, locket, bustle, knickers, bodice, tailtaille, garniture, spats, and gloves. The whole set! Contains the Respectable Alabaster ovalcrown, locket, bustle, knickers, bodice, tailtaille, garniture, spats, and gloves. The whole set! A once-fashionable oval-crowned hat made of felt that has seen better days. It's unique silhouette is complimented with dull ribbon. Not much can be stored within the dented casing of this rusty locket. A patchwork bustle and skirt, crumpled and wrinkled from being shoved in a trunk. This pair of dilapidated finery can either be worn with or without an accompanying skirt. A lacefront bodice constructed of swatches of mismatched gray fabric. The sleeves used to be poofy, but now they're just disappointing. If one was looking to make their wings stand out, this decorative drape might have been the perfect accessory. Now it's not much better than a rag. A moth-eaten pair of rough spats. A moth-eaten pair of rough gloves. A fashionable oval-crowned hat made of rainbow felt. It's unique silhouette is complimented with shining ribbon. Tiny bits and bobs can be stored within the pop-open casing of this iridescent locket. A decorative bustle and skirt, flowing extravagantly from the waist in waves of rippling rainbow fabric. This versatile pair of rainbow finery can either be worn with or without an accompanying skirt, depending on the kind of statement the wearer wants to make! A lacefront bodice constructed of highly fashionable rainbow fabric. The sleeves are real poofy! A simple yet eye-catching wrap of rainbow ruffles and ribbons that is worn on the tail. If one is looking to make their wings stand out, this decorative rainbow drape is the perfect accessory. A smart pair of soft rainbow spats help to pull off the whole look! A smart pair of soft rainbow gloves help to pull off the whole look! Contains the Polychromatic ovalcrown, locket, bustle, knickers, bodice, tailtaille, garniture, spats, and gloves. The whole set at a savings of 10%! Woodland Turkeys will start strutting through the Boreal Wood coliseum stage next week, and will only be around for a few days! We'll also be running a gem promotion during the same time period. Each package of gems you purchase from Flight Rising, you'll receive 10% bonus gems! Very nice! Liking Kelly Green! Edit: Wow, second! Also, have just noticed the little details on the Patched Beggar set, and loving them, perfect for lore opportunities! A very good job to the artists! My inbox is always open if you need to talk.